We received a Black Krim Tomato and a Chinese Five Color Pepper Plant from a friend and decided to plant them in our raised bed garden. We have had difficulty with full size tomatoes splitting in previous years. Splitting in tomatoes is usually due to inconsistent watering - lack of water followed by too much water. Too much water causes the fruit of the tomato to expand faster than its skin, causing the splitting. Because of this previous splitting, we decided to plant our two gift plants with a device called the Groasis Waterboxx. A cutaway view of the Groasis Waterboxx. It channels dew and rainwater using its tan lid, stores this water in the green reservoir, and slowly releases it through the wick to the roots of the growing plant. The Groasis Waterboxx was originally designed by a Dutch tulip and lily breeder to grow trees in deforested areas without irrigation. However, it has been found to work very well for gardening as well. It collects dew and rain water (and water that the plant releases through transpiration), funnels this water into and stores it in a reservoir, and then slowly releases it to the roots of the growing plant. It comes with a hole for a single wick, but more can be inserted for more water hungry plants. We inserted a second wick for our tomato and pepper. We transplanted the plants into a 2 x 2 foot raised garden plot, and placed the Waterboxx after lightly watering the soil. We filled the Waterboxx with about 4 gallons of water. The Black Krim Tomato (left) and Chinese Five Color Pepper (right, not yet visible) on May 28, 2015. 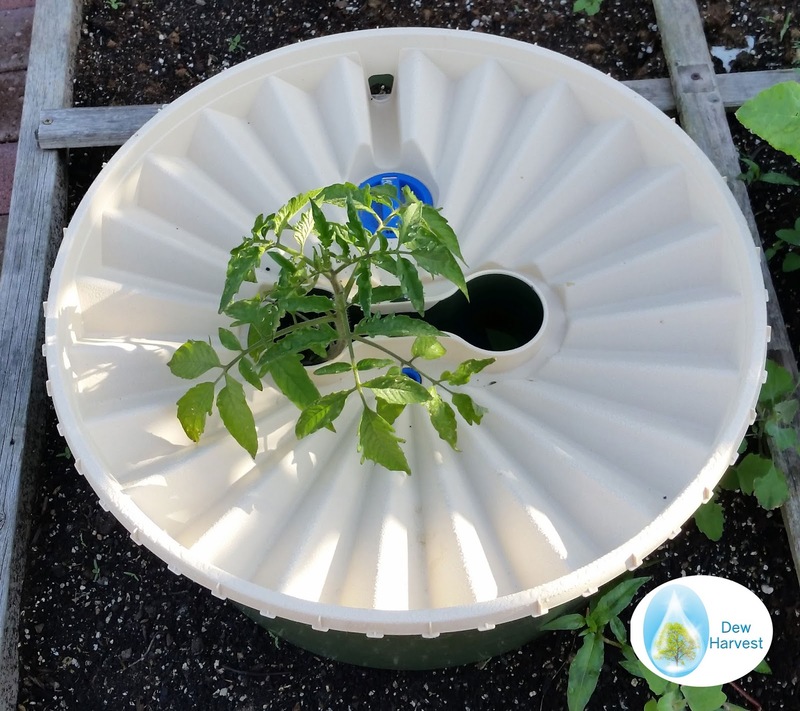 The Waterboxx provides all needed water to our plants, and will adjust how much water is released based on the dryness of the soil. If we find the Waterboxx reservoir going dry, we will refill it. However, the Waterboxx will do a good job, we think, of keeping the soil a consistent moisture. Also, the Waterboxx will keep the pepper plant cool, important as peppers won't produce in very hot weather. 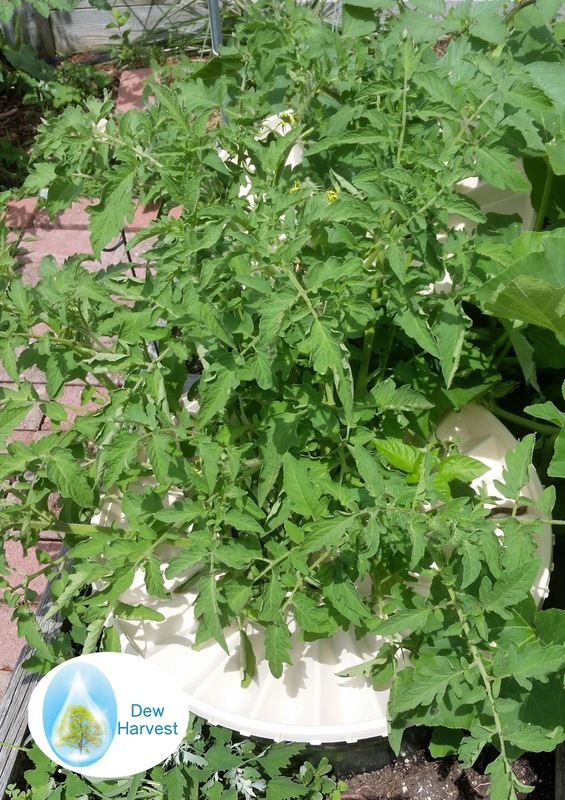 On June 18, 2015, the Black Krim Tomato (left) has proven to be a prolific grower while the Chinese Five Color Pepper is just visible to the right. No water has been added to the soil or the Waterboxx since Waterboxx set up May 28. We did add 2 small Jobe's organic fertilizer spikes to the soil around the Waterboxx sheltering the plants on July 1. We haven't added any water to the Waterboxx or watered the plants manually in any way - but they are still growing great. Our next test for the Waterboxx will be when we have tomatoes growing - if they split it will mean we don't have consistent soil moisture. We will continue to update this post throughout the growing season with pictures of our Black Krim Tomato and Chinese Five Color Pepper. We harvest 10 Black Krim Tomatoes from our Waterboxx this year - not bad as none of our neighbors had any tomatoes. We are growing several other plants with the Waterboxx, a complete list is available here. You can buy the Groasis Waterboxx here.